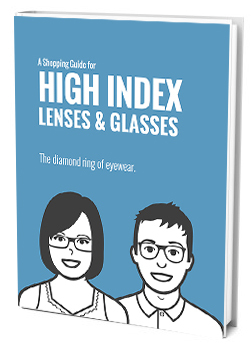 You Are Here: Home » High Index Lenses » Are High Index Lenses Also Impact Resistant? Are High Index Lenses Also Impact Resistant? Are high index lenses impact resistant? High index lenses are not naturally impact resistant. Because they are typically processed to be as thin as possible, and because high index is a plastic that will crack when enough force is applied, many pairs of high index prescription lenses would fail an impact resistance test. Some stronger prescriptions require even high index lenses to be thick enough that they would pass ANSI’s standard impact resistance test, though it is impossible to find a pair of high index prescription glasses that pass ANSI’s “high impact resistance” test. If your lenses are thick enough to have standard (safety) impact resistance, you may be able to have your optical provider supply you with a Z87 stamp, certifying them as safety glasses (as long as the frame they’re in is also safety). Polycarbonate is a good choice for impact resistance if your prescription is not very high, or if you need high impact resistance. High index lenses are more scratch-resistant than polycarbonate, so if you’re looking for lens longevity as opposed to impact resistance, high index plastic is still probably the best choice. If you are interested in prescription safety glasses in a wraparound frame, you may not be able to get the lenses in high index plastic anyway because larger wraparound frames often have large lens pockets that will not work with many prescriptions in high index plastic. If you are most concerned with keeping your eyes safe from impact, you should definitely purchase a pair of prescription glasses with polycarbonate lenses. If you are most interested in a pair of good-looking glasses that will last a long time, high index plastic is the material for you. It is important to consider the fact that, in a dangerous environment, it is a poor decision to trade safety for aesthetics. It is also worth noting that you do not want to have any issues with OSHA should they visit a job site while you’re wearing questionably suited glasses for your work. If you are working at a job that requires safety glasses, it is a good idea to check with a safety officer to see what’s accepted where you work before purchasing any glasses. And remember – better safe than sorry! You only have one pair of eyes, so it’s a good idea to protect them.